POWER - Haul thousands of tons of cargo over Sherman Hill Summit in the legendary Union Pacific Gas Turbine. PRECISION – Beat the clock as a Deutsche Bahn driver on the challenging West Rhine Mainline. West Rhine: Cologne to Koblenz, including DB BR 155, BR 146.2, BR 101 and BR 294 locomotives. 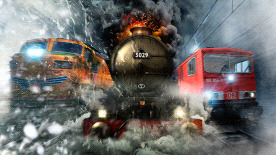 Train Simulator 2016 – are you ready for the extreme?